At Ashford & Partners, we are rare among accountants. We know what’s involved in building and running a successful business because we’ve done it. Our founding partner Chandra Shah first built a career on two continents as a corporate chartered accountant. Then he built from scratch a very successful fashion wear company. That was where his son and fellow founding partner Neel got his early insight into cash flow and profit margins. At first Neel just watched and learned. Then he took a hands-on role through his teenage years before heading for university. Neel went on to qualify as a chartered accountant like his father and now leads our team. Chandra takes a consultancy role. Our rare mix of accounting expertise and commercial experience sets us apart. It’s a combination you don’t find every day on the High Street. If you think accountants can be a little dull, here’s the exception. Numbers may always have come easily to Neel Shah, but his life has been anything but ordinary. He was born in Nairobi to a Kenyan Asian father and Madagascan mother and celebrated his first birthday on a beach beside the Indian Ocean. The family moved to the UK when Neel was three after his father Chandra’s employers relocated him. His father had trained as a chartered accountant in London and by then had worked on two continents. Now he was back in the UK for good. At first Neel struggled with losing the freedom he’d had in East Africa — he even tried running away from home. There were no fences in Nairobi, now he felt confined, and at first he refused to speak anything but Swahili. But Neel did adjust and discovered early on that he was good with numbers. When his father launched his fashion wear business in the early 1980s, Neel got the chance to put this skill to use. He could just look at a set of figures and understand how they worked. He grasped cash flow, and he knew how to calculate healthy profit margins. Through his teenage years, Neel worked weekends alongside his father at the warehouse. As well as balancing the books, he learned how to hustle, how to get clients to pay, how to manage staff. By the time he left for Cardiff University, he understood how a business worked — from the inside. Neel graduated with a 2:1 in Accounts and Economics in 1991. But before launching his career, he dusted down his Swahili and went back to East Africa for six months. He spent time with family in Kenya and Madagascar, and travelled to the southern tip of the Sahara. He climbed Mount Kenya and explored the Madagascar rain forest — on his own. His horizons now widened, Neel was ready to start work. His first post was as a management accountant for an industrial diamond manufacturer. Then came Langley & Partners, a business accountancy practice in north London. Here he thrived and qualified as a chartered accountant. 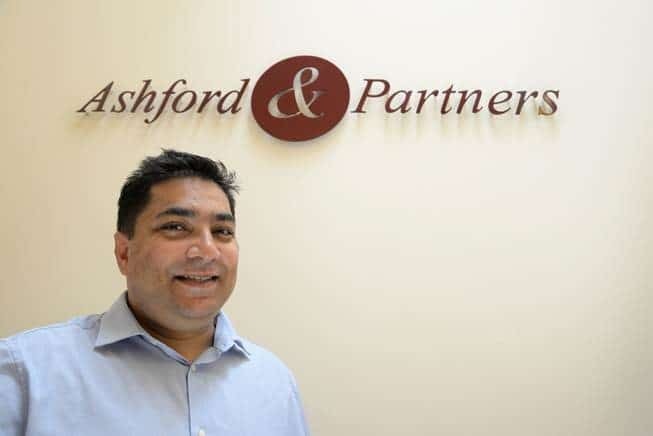 Neel stayed there until he and Chandra founded Ashford & Partners in 2003. The practice now specialises in working with business owners who want more. More insight, more understanding, more expertise, more than a set of annual accounts. Neel is also passionate about giving back. He is for example a long-time sponsor of Parkfield Youth Football Club in Harrow where he has been playing a key role since 2006. Neel and wife Bansi — who also works for Ashford & Partners — have three children and they are strongly committed to creating plenty of space for travel, adventures, and having fun as a family. Consulting partner Chandra Shah has lived and worked on two continents and has seen exactly how business works from both ends of the accounting telescope. He was born, grew up and was educated in a colonial Kenya. His childhood in Nairobi was a tapestry of adventure as he and his friends explored on their bicycles or hitch-hiked. In 1961, Chandra left Africa behind — for now. He arrived in London aged just 19 and began work as a trainee chartered accountant with a firm based in Holborn. After qualifying, his career took off and in 1969 he was made an offer he couldn’t refuse: the chance to go back to Kenya. He returned to Nairobi as an audit manager within a large corporate accounting firm. This role allowed him to greatly expand his experience and enhance his skills. Chandra meanwhile met and fell in love with his future wife Jasu, who was on holiday in Nairobi from her native Madagascar. They married, and their first child — Neel — was born in Kenya. Then a fresh opportunity arose back in the UK, and in 1973 the family headed for north London where they made their permanent home. Chandra continued to work as a senior chartered accountant until the late 1970s. Then he stepped away from his chosen profession and into the world of commerce. With his brother, he launched a fashion wear wholesalers. They built this into a successful and well respected enterprise. It was here both Chandra and Neel honed the business skills that set them apart from the average High Street accountant. In 2003, Chandra stepped away from the fashion wear business to establish Ashford & Partners with Neel. Now he acts as consultant partner while still working with a select group of clients on a regular basis. One of my passions is education and through the support of our clients and the growth of the business we’ve helped a number of great causes and charitable organisations. I have enjoyed travelling and overcoming challenges by trekking the wild places in the world. My treks have taken me from Kilimanjaro to the rainforest of Madagascar. That spirit of adventure has helped me to develop as an entrepreneur, and given me the resilience to help other people find their route to success. Neel first got involved with Parkfield Youth Football Club back in 2006, when his son was a member. The club — founded in 1945 — had over the years become a key part of the community in Harrow, north London. But now it was losing direction and in serious financial difficulties. Parkfield’s management team asked Neel to help and he took over as club treasurer. He put in place a cash flow recovery plan that saw the club regain stability within a year. As he got more involved as a volunteer, Neel could how important the club was to the young players. The boys were learning valuable lessons for life as well as honing their soccer skills. So he started exploring new ways of raising money. One solution was to ask parents to sponsor a team and Neel soon got his first volunteers. Many more followed, along with local business sponsors. Parkfield could now invest in facilities and coaching, attracting more and more families. And for the first time, all the players were wearing the same kit! By the end of 2018 season, 240 boys aged between seven and 18 were playing in 21 teams — and there was £40,000 in the bank. “Neel and Ashford & Partners have been volunteering for more than 10 years and have given us so much support. Not something you’d expect from a firm of local accountants! Before Neel got involved, Parkfield was not in a strong position and had a weak cash flow. But he helped turn this around and now the club is financially secure. Could we help you achieve your financial goals? Call us on 01923 209859.